San Francisco middle schools are in the midst of spending the largest gift ever given to the district. The district will use about half of the money to beef up its technology infrastructure. The rest will go to 12 middle school principals, each of whom is getting a $100,000 grant. Those principals are now trying to parlay the money into real change. Presidio students consistently post high marks on state tests. Kids began using iPads at Presidio three years ago. Payne now plans to use his innovation grant to add to his already solid academic program. “After school we started a robotics club. … Part of the grant will also go to strengthening and building on our outdoor education program,” Payne said. Payne is also investing the money in a zero-period science class just for girls of color. The situation is very different across town at Martin Luther King Jr. Middle School. King, located in the city’s Portola neighborhood near the intersection of Highways 101 and 280, is a more typical urban school because it serves a large number of at-risk students. Roughly 80 percent of students at the school are eligible for the federal free and reduced lunch program. Principal Natalie Eberhard says unlike students at Presidio and private schools, most of her students don’t have an Internet connection at home, let alone their own laptop computer. 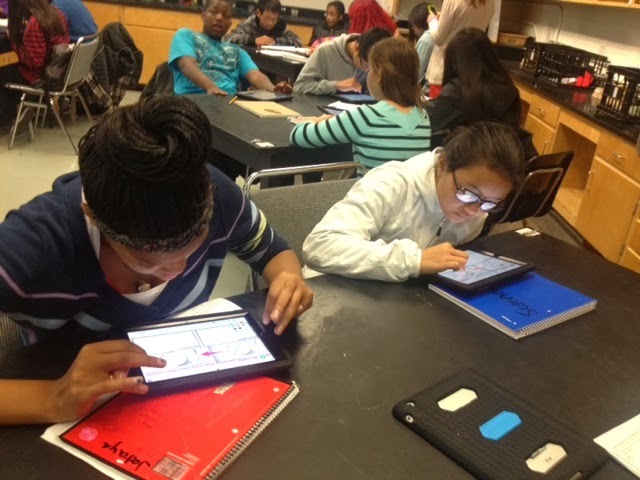 Eberhard is using the grant to put iPads in all of her science classes. Students at King are more engaged in these classes now that the tablets have arrived. However, teachers believe the real challenge is to make sure the device is not just replacing paper and pencil. La says her goal is to use the device so students can work together and teach one another. She and other educators say they need much more training so they can take advantage of all the educational apps that now exist for the iPad in their classroom. Education tech expert Steven Anderson says “tech training” is best taught when information is spread out in bits and pieces over the entire year. He believes the best classroom projects allow students to use technology to investigate issues that are “meaningful” in their lives. Anderson points to one class in North Carolina that used technology to analyze economic data, and conduct science experiments. The class was investigating the impact of a proposed high school stadium in their neighborhood. They ended up writing letters to their city council. “The kids are now talking about things you’d never think they would talk about because they’re engaged. … (The issue) has meaning to them,” Anderson said. Middle school principals like Natalie Eberhard like the idea of revamping instruction using technology. Eberhard thinks this grant will be a catalyst for real change. If the district’s middle school principals can blow up that box in ways that produce real academic results, SFUSD officials expect Bay Area tech giants will be even more willing to share their wealth in the name of changing education.